It’s a question that has been asked in countless films and a premise that has been dealt with many times with varying degrees of success: What happens when the bad guys’ money gets ripped off and ends up in the hands of the good guys? Generally the bad guys come looking for it and will do bad things to good people in order to get back what is rightfully theirs. A NIGHT IN OLD MEXICO handles this scenario in a very commonplace manner. A NIGHT IN OLD MEXICO marks director Emilio Aragón’s second feature film and first (primarily) English language film. Previous work as an actor/composer/director has brought Aragón a good deal of success on television in Spain. Coming off his writing/directing feature film debut PAPER BIRDS (2010), which was well received at a slew of international festivals, Aragón here takes a stab at a drama centered on a man and his grandson having unpleasant dealings with bad guys (and worse guys). 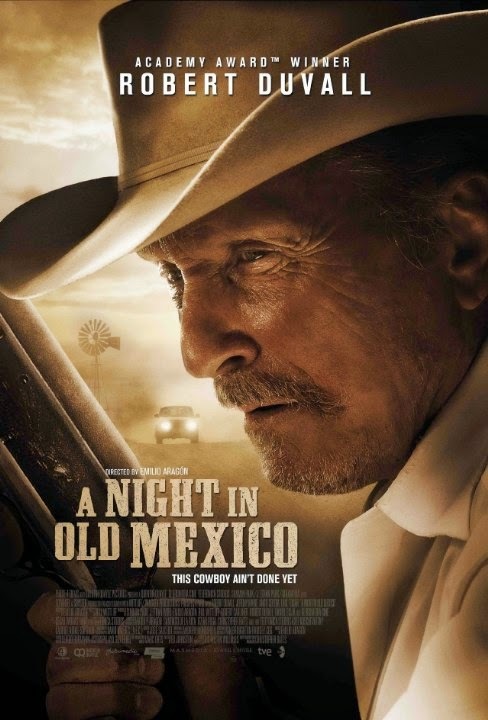 Academy Award winner (and seven time Oscar nominee) Robert Duvall employs his trademark idiosyncrasies in the role of Red Bovie; an elderly, lonely and pissed-off coot who has lost his cattle, horses and his enormous Texas ranch due to the inability to pay back a bank loan. In an incredible coincidence, on the same day he is to leave his ranch for good, his wannabe cowboy grandson Gally (whom Red has never met- due to a falling out with his own son Jimmy) shows up out of the blue trying to find some work on the ranch and connect with his gramps. Upon the unveiling of his new digs (in a woeful trailer park), Red refuses to "live in a tin can" and takes off in his Cadillac with Gally (Jeremy Irvine, WAR HORSE), heading to Mexico to cut loose with some wild women and show his grandson that there’s more to life than just “sucking in air and pulling on your peter.” Duvall’s vibe here as the hard-drinking, unruly geriatric is both entertaining and endearing. The two embark on a series of unlikely misadventures that finds Gally attempting to control his grandfather’s raging in whorehouses and dingy bars as they stumble through dusty backstreet alleys of a Mexico where danger seems to always lurk. A grandson’s revelation, a bag of found money, and an unrealistic relationship with a beautiful young Mexican singer (Angie Cepeda) add to what results in a cockamamie story. Preposterous “Good vs. Evil” scenarios dealing with ownership of the moneybag play out in an unfavorable fashion. This is screenwriter William D. Wittliff’s first screenplay since THE PERFECT STORM (2000). Prior to that he had great success writing screenplays for LEGENDS OF THE FALL and LONESOME DOVE (for which Duvall won a Golden Globe for his performance); and oddly, a trio of scripts that became movies featuring Willie Nelson in the lead role. Wittliff is a lifelong Texan and has often brought elements of his upbringing to his scripts, but here the time frame given for the development of relationships between the three central characters (and the life-altering events that take place) seems far too ridiculous to be believed. So long, cowboy. Undistinguished and unsatisfying. 2 out of 4 stars.